Why to choose Bapdas Inverter? If the inverter is damaged when using, we will send one new to replace for free. Bapdas devoted to develop advanced professional automotive products. High quality assurance and super 18-months warranty ensure your purchasing. You won't be disappointed with Bapdas inverter for your car. . 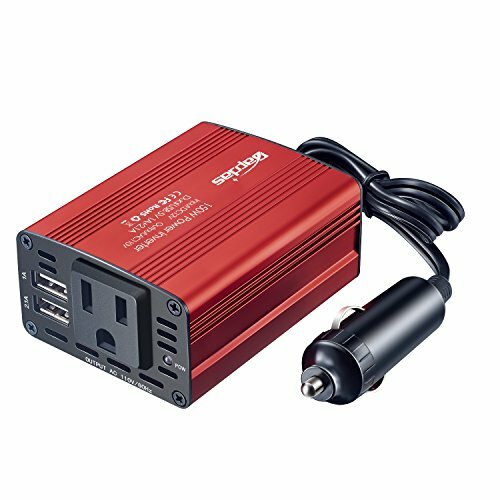 Ideal for the electric appliances in the car such as lamps, cell phones, GPS, laptops, MP3 players and power tools. Maybe you don't often use it, but everyone should get one in the car, just in case. Silent Fan: Smart cooling fan makes the car power inverter silent when operating, and it runs faster when it gets warmer. Safety: Full-protection with short-circuit , low-voltage , over-charge,over-voltage, over-load,over-temperature protection,built-in fuse. Utility Cord & Cigarette Lighter: Placed random, about 16 inches length cable with cigarette lighter plug since we can reach it to power a laptop in the rear seats. When charging your iPad or large device, please use the 2.1A USB port and keep the other USB port free. Please understand your device wattage. Caution! do not use high power electric devices such as hair dryers, electric heaters, curling iron and etc. Not recommended to use for a long time when vehicle is not running. If you have any questions about this product by Bapdas, contact us by completing and submitting the form below. If you are looking for a specif part number, please include it with your message.